AutoZorb®II is a lightweight, high loft, high performance synthetic fibrous insulation blanket, designed to provide excellent acoustical and thermal protection. It is comprised of 100% polypropylene microfibers with a spunbond scrim surface for added strength and fiber protection. AutoZorb®II is specifically designed for automotive interior thermal and acoustical applications, including doors, liftgates, instrument panels, pillars, package trays, truck liners, dashmats, speaker, headliners, and carpet areas. The high loft microfibers efficiently dissipate acoustic energy at a very low mass, providing an unparalleled combination of performance, cost and weight. 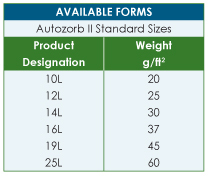 AutoZorb®II comes in widths up to 2032 mm (80 inches). The spunbond facing can be ordered in either white or black. Custom products between 20 and 60 g/ft2 and up to 51mm (2 in.) thick are available by special order. Copyright © 2003-2019 AIM, LLC All Rights Reserved.